German car manufacturer BMW says it has agreed to sell its Formula 1 team to Swiss-based Qadbak Investments. BMW has been looking for a buyer for the team since it announced in July that it was pulling out of the sport at the end of the current season. Qadbak bought Notts County FC in July through its Munto Finance company. Earlier on Tuesday, F1's governing body gave BMW Sauber "14th place" on the grid next year, meaning they are first reserves to fill any vacancy. The FIA has announced the expansion of the F1 grid to 13 teams for next season, with Lotus, Campos GP, Manor and US F1 all joining. However, it will be "consulting urgently" with the 10 existing teams with a view to increasing the number of teams to 14. There are also doubts over the F1 future of current teams Renault and Toyota. Renault are embroiled in a race-fixing controversy while Toyota insist they are not signing off their F1 budget until November. Despite previous doubts over its future, the FIA described BMW's application as "high quality" and a team statement said: "We are pleased to confirm that the FIA has indicated that we may have a place in the 2010 Formula 1 World Championship. "The team expects to line up on the grid for the first race of the 2010 season." BMW, which took over Sauber in 2005, announced in July it was pulling out of the sport at the end of the season citing "current developments in motorsport" as the reason for the decision. Founder Peter Sauber, who holds a 20% stake in the team, tried to buy the team last month but negotiations collapsed after he said BMW's demands were "far too high". BMW has not revealed financial details of the deal it has agreed with Qadbak, a company which it described as representing the interests of "certain Middle Eastern and European-based families". "A strong investor has therefore been found for the Hinwil-based team," added the statement. "Qadbak's interest in the team will be represented by Lionel Fischer, a Swiss national." When the Qadbak-owned Munto Finanace bought League Two side Notts County in the summer, they wiped out debts of £1m when taking over from a supporters' trust and made Championship football their five-year target. They have made a statement of intent by installing former England manager Sven-Goran Eriksson as their director of football while former Spurs, Arsenal and Portsmouth defender Sol Campbell has also moved to Meadow Lane. 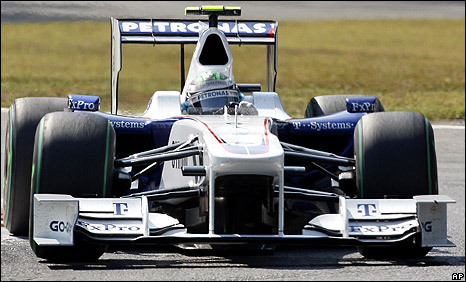 BMW Sauber finished third behind Ferrari and McLaren in last year's constructors' championship but have had a disappointing 2009 so far. They are currently lying in seventh place with the team claiming only one podium finish all season. Drivers Nick Heidfeld and Robert Kubica are 13th and 15th respectively in the drivers' standings. What does BMW's exit mean for F1?